What are these tires used on? How concentrated is the global tire industry? 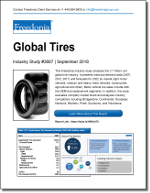 The global tire industry is concentrated in certain segments, most notably in motor vehicle and off-road tires. This concentration is attributable in large part to the fact that building production capacity for larger tire types requires significantly more investment. In 2017, the top 16 tire suppliers combined to supply 72% of the global market. Each of these firms had over $1 billion in tire-related sales. Does the production of tires always require a large investment? Production of smaller tires, including motorcycle tires, can be accomplished without massive investment in facilities, which makes manufacturing by smaller ventures economically viable.